The English Premier League (EPL) may lag behind the top North American sports leagues in terms of total revenue, but during the 2012-13 season, the EPL outpaced its American counterpart, the National Football League, in commercial revenue, according to data provided by the Sports Business Group Deloitte and the sponsorship consultancy firm IEG. The figures for commercial revenue consist mostly of sponsorship deals with the leagues as a whole and singular teams or clubs. Selling these deals is clearly an art at which the English excel, as everything in the EPL now has a logo on it. 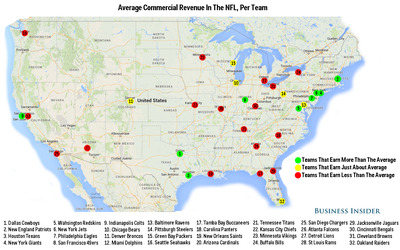 Last year, the NFL saw its commercial revenues rise by 5.7%, up to £630 million ($US1.07 billion). The Premier League surpassed that with almost £700 million ($US1.1 billion). 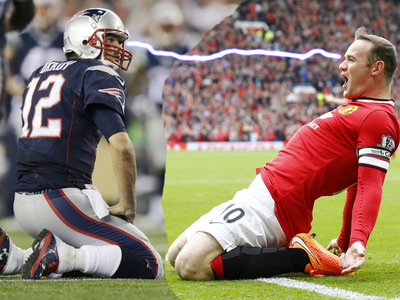 Commercially speaking, it has been a fruitful time for English football. In 2010, the Premier League’s revenues were only £450 million, meaning the league experienced a commercial revenue increase of 57% in just the last four years. With EPL leader Chelsea FC recently snagging a reported $US16 million-a-year shirt deal with Turkish Airways, the revenue gap between the English and American leagues is set to grow even bigger. 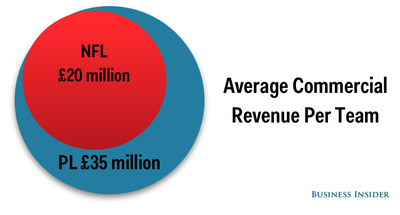 But just because the English League makes more money through sponsorship deals than the NFL, it does not mean that revenue is split evenly among clubs. Technically, because only 20 teams compete in the Premier League — compared to the 32 of the NFL — English clubs should each pull in an average revenue that is almost double their American counterparts. But that’s far from the case. In the NFL, an idea known as “sport socialism” prevents an excessive concentration of wealth in the hands of a single team. That is the idea behind the salary cap, which limits the amount of money that any of the NFL’s 32 teams can spend on a player’s salary each year. As a result, 61% of total revenues — which includes a huge broadcasting contract not included in the charts above — is equally split among the teams. That would be unthinkable in the Premier League, which is the economic equivalent of pre-Revolution France. 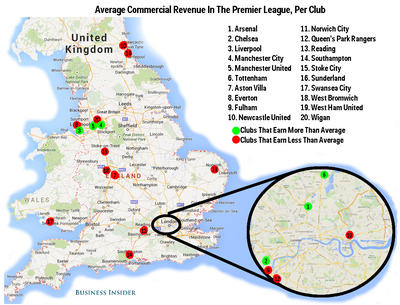 Only six English clubs earn more than the average revenue (figure below). The Guardian DataLab reveals that in the 2012-2013 season, Arsenal, Chelsea, Liverpool, the two Manchester clubs, and Tottenham alone made 82% of the total commercial revenue, with the other 14 clubs splitting the rest. 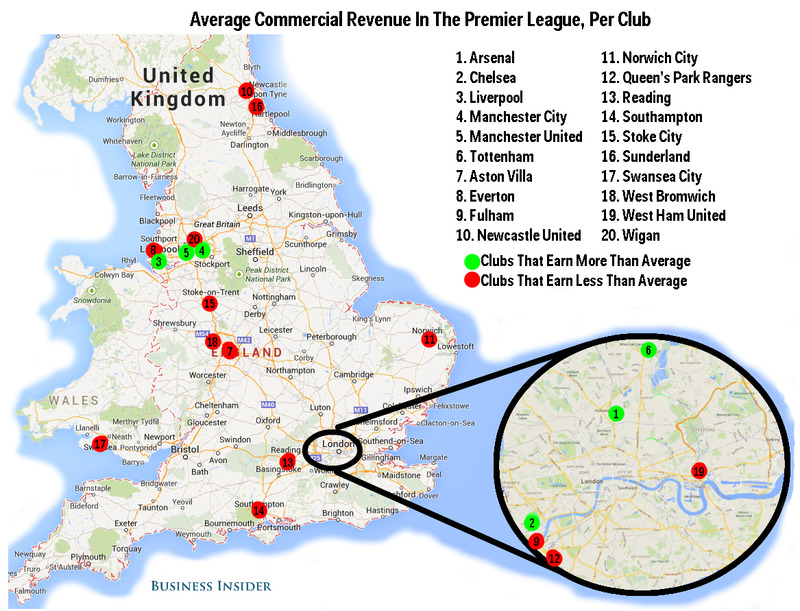 In the EPL, commercial revenue is tightly-linked to on-field performance. In August, Bloomberg noted that only this elite group, with the exception of Tottenham, have a real shot at winning the league. 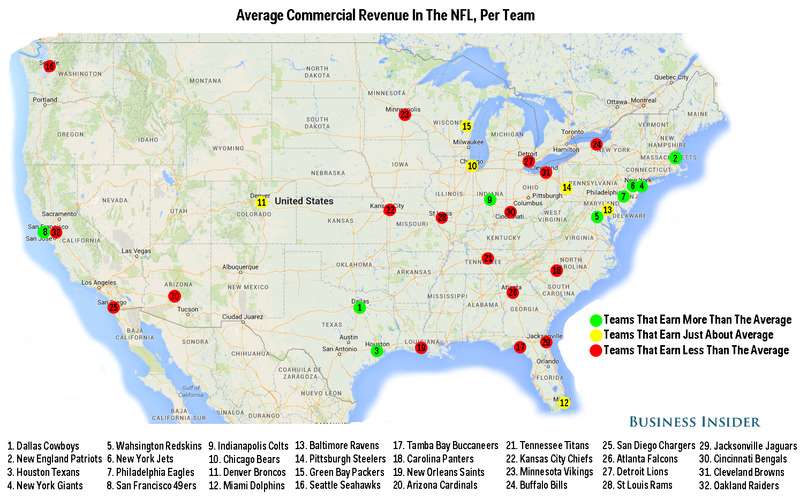 In contrast, in the NFL, nine teams earned above the average in the 2012-13 season. Six more earned about average, meaning that 17 teams earned less than average. Among the teams that earned less than average were the Seattle Seahawks, which ended up winning the Superbowl — meaning that the link between revenues and on-field performance is not as strong in American football. 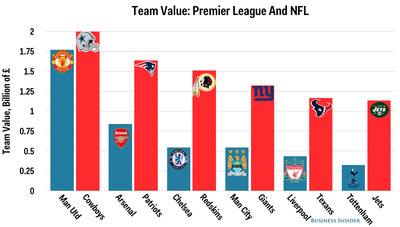 Additionally, Forbes calculated the total value of all the NFL franchises and the top 20 European football clubs. 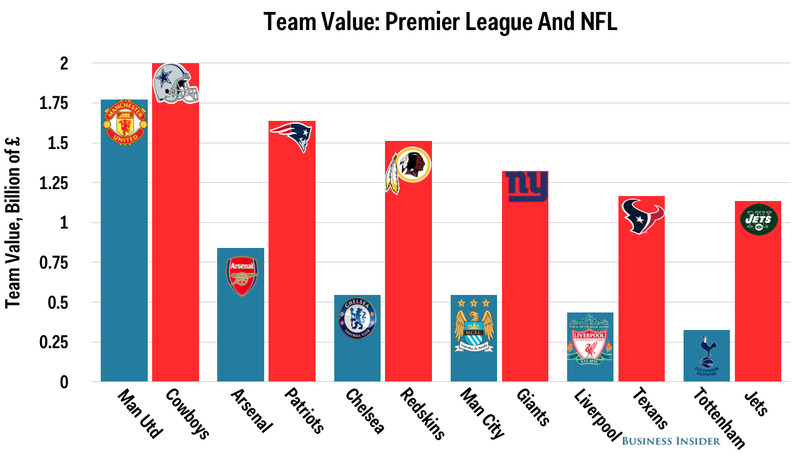 In the chart above, the top five highest-earning American football teams (red bars) are all valued at more than £1 billion. Meanwhile, of the top five English clubs, only Manchester United exceeded that amount. The highest-valued American team, the Dallas Cowboys, are barely worth twice as much as the fifth-highest valued team on the chart, the New York Jets. Manchester United, on the other hand, is worth five times more than Britain’s fifth-highest valued team, Tottenham. These figures also include the stadium revenues, where English clubs suffer because of their smaller stadiums (and thus smaller crowds). The smallest figure recorded at the Washington Redskins’ FedEx Arena, 56,000 spectators, is still much bigger than a sold-out stadium at Chelsea’s Stamford Bridge, 42,000. 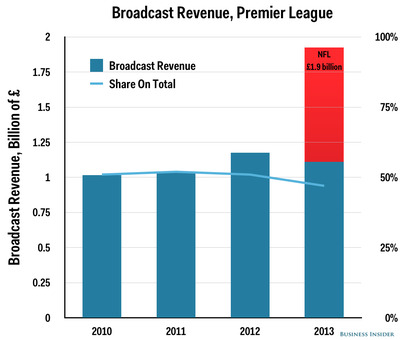 The biggest difference, though, has to be broadcast revenue, where the NFL remains on top. That’s because American broadcasters, who play in a market of 300 million spectators, have more money to spend than British broadcasters, such as BT, Sky, and the BBC, where the national audience is around one sixth of the American figure. Deloitte calculated that the Premier League has cashed in only £1.11 billion for the 2013 season, down 5.5% from the previous year. This might also be related to a weaker performance in European competitions than in previous years: The more you advance in the Champions League, the more you earn from broadcasting rights, because you are playing more games and more important ones. The NFL instead earned an average of £1.9 billion ($US3 billion) per year in the last few seasons, although the exact figure is hard to determine as it is made up of multi-year deals and local TV or radio broadcasting agreements with singular teams. As all but one NFL team are private entities who make a profit, they tend not to publish their budgets or disclose their deals. The Green Bay Packers are the only community-held team, similarly to football clubs such as Barcelona. They have to present their budget to the shareholders every year, and this is one of the strategies for estimating the profits of the whole league. 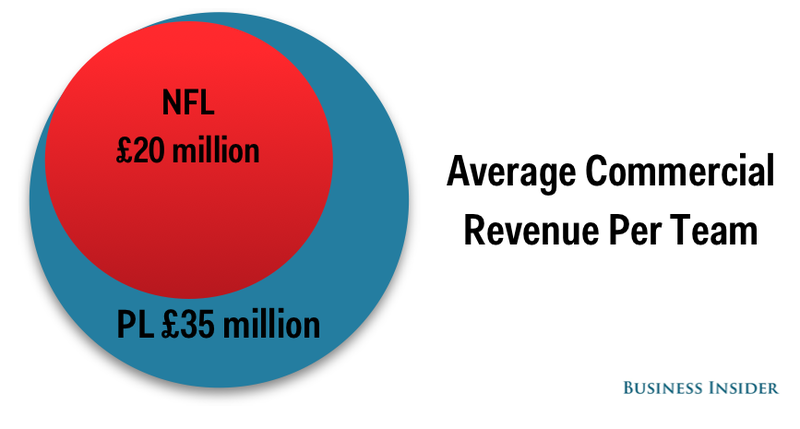 In conclusion: NFL teams earn more money through broadcasting because they reach a larger national audience and because these revenues are almost equally split among each others. Premier League clubs, or at least the very top teams, are better at signing sponsorship deals.